Pianos and keyboards especially for what you need, in a unique way! 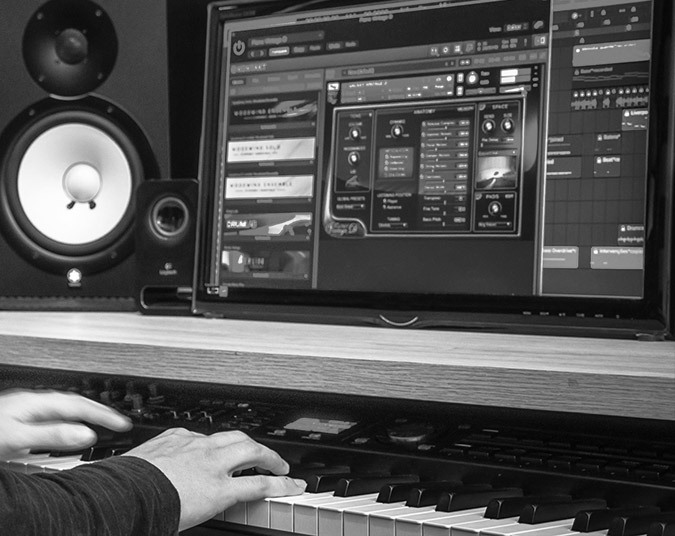 See how the process of creating and recording pianos, keyboards and more is, all at your fingertips through the website! Get to know some of the timbres used by Rodrigo Lana in his works! The pianist and music producer Rodrigo Lana has created a simple and practical way for your creations to reach people anywhere in the world, with great quality and speed! Through an interactive platform it is possible to hire the creation of arrangements, piano recordings and various virtual instruments, with high sound fidelity and recorded from tools used in great productions of music and cinema. Everything is done according to the client’s directions and needs, but with the great experience, creativity and style of the artist, bringing an unique aspect to what is delivered. Rodrigo’s recordings cater to a wide variety of people: bands and artists who are producing a record or single, singers who want instrumental accompaniment to launch songs and videos, beginner and experienced composers who want to turn their ideas into sound reality and more! Make a quote below and find out how simple it is to hire a creation especially for you! We just need some information to submit your budget! If you have any questions, write to rodrigolana@rodrigolana.com.br or contact us at whatsapp +55 31 98743-4325. Since 2012, Música Mundi has taken shows to various events, recorded and post-produced renowned artists and also beginners, as well as taught music and music production to various people through their courses. Created and managed by Rodrigo Lana, it is a great means of propagation and negotiation of his works, offering organization, professionalism and quality to the contractors. © 2018 Música Mundi. Powered by A Porto Design Studio.